Cloud transformation involves a move away from physical resources in data centers to virtual resources in public clouds – taking business applications along with it. As a result, the cloud has become an extended part of the WAN, and IT teams need an interconnect to bridge the distributed enterprise offices to workloads in the cloud. With Citrix cloud on-ramps, you can quickly connect branch offices and locations to applications running in SaaS, IaaS, or PaaS environments such as Amazon Web Services (AWS), Microsoft Azure, Google Cloud Platform (GCP), or in the data center. Citrix SD-WAN automates these connections and delivers unmatched performance for mission- and business-critical applications to help maximize uptime and productivity. A Citrix SD-WAN virtual appliance (VPX) is available on the Microsoft Azure, AWS, and Google Cloud marketplaces. By deploying a VPX in an IaaS or PaaS cloud and a Citrix SD-WAN appliance on-prem, your network will benefit from advanced capabilities such as dual-ended QoS, last mile visibility, congestion awareness, and link resiliency with failover in milliseconds. With a Citrix SD-WAN at both ends, you can quickly establish high-availability connections to VPC (Virtual Private Cloud) or VNet (Virtual Network) resources. A multitude of security features protect your applications, network, and cloud including strong encryption, IPsec connectivity, and a built-in stateful firewall. Ensure users anywhere can seamlessly access workloads across clouds and data centers with the best experience for cloud and virtual applications. 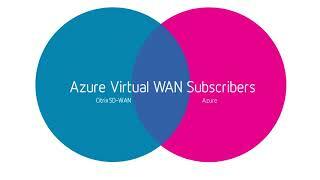 Citrix SD-WAN for Azure Virtual WAN offers an easy and automated way to set up large-scale connectivity to Microsoft’s global backbone. This solution automates branch to cloud connectivity and quickly onboards all of your sites at once in just minutes. Securely transport traffic over the public internet by configuring IPsec tunnels from the Citrix SD-WAN orchestration service with a few simple clicks. Monitor the status of connections and redirect traffic to alternate tunnels or hubs as needed. And, using Microsoft’s global network backbone, you can optimize routing to ensure the best application experience. Citrix SD-WAN and the Equinix Performance Hub with Equinix Cloud Exchange (ECX) integrated solution provides enterprises an easy to manage network solution that is both scalable and reliable for hybrid, multi-cloud deployments. Citrix SD-WAN creates secure virtual overlays of multiple aggregated links from branch offices directly to Equinix locations around the world. With ECX, enterprises can quickly spin up additional cloud compute and data analytics resources when workload spikes occur. Citrix SD-WAN selects the best path for each application to ensure high application quality and instantly fails over if a network connection is lost or becomes degraded. And, with ECX, organizations can enable cloud failover to keep their applications running in the event of outages. The ECX service provides low latency and cost-efficient connections to cloud providers including Microsoft Azure, AWS, and Google Cloud, as well as optimized connections to SaaS applications including Microsoft Office 365.